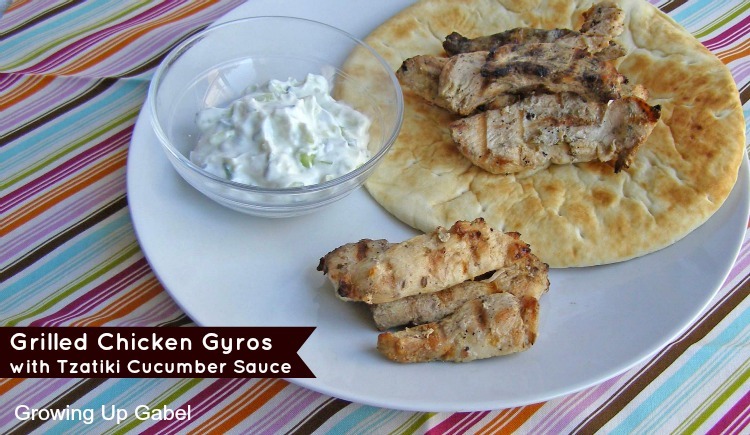 Chicken Gyros with a homemade tzatiki cucumber sauce is hands down our favorite family meal. The best part is that it comes together in about 30 minutes. Pieces of chicken are marinated in a lemon juice and olive oil marinade before being grilled. 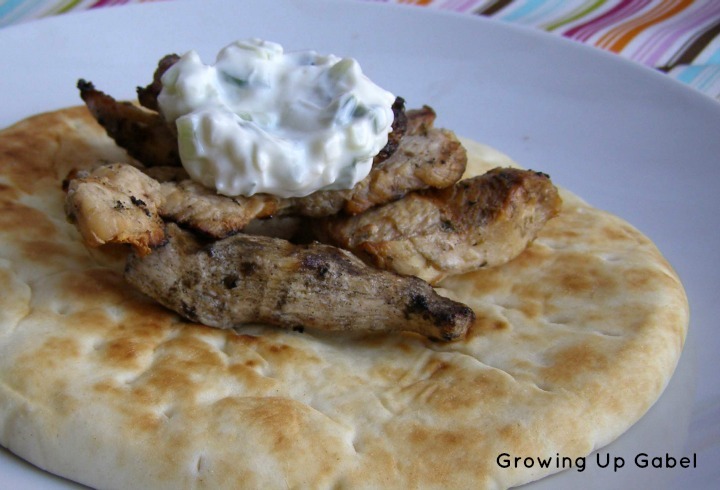 Wrap the chicken gyros in pitas and serve with a delightfully fresh yogurt cucumber sauce for a light yet filling summer meal. Just about a decade ago I spent a summer living and studying in Athens, Greece. Just about every day for lunch I would stop at a little restaurant on my way home from campus and pick up a souvlakia. Souvlakia looked like what Americans call “gyros” only instead of lamb it was almost always made with pork that was seasoned slowly roasted on a rotating skewer. The slouvakia was served wrapped in a pita stuffed with meat, french fries and tzatiki and then sprinkled with paprika. It was divine. These chicken gyros are technically my version of a cheater souvlakia. Since I don't own a large roasting skewer, I use a grill to cook the meat. The spices aren't exactly the same, but it the gyros are delicious in their own right. And the homemade tzatiki cucumber sauce is just amazing. I like dip french fries in it! This recipe is for just over one pound of chicken, but we always triple it because we want leftovers! Combine olive oil, lemon juice, oregano, and garlic in a bowl. Add chicken and toss to coat. Season with salt and pepper. Meanwhile, in a small bowl combine all ingredients for tzatiki sauce. Season with salt and pepper and set aside. Cook chicken and onions on a grill over high heat, turning once or twice, until tender and cooked through. Serve chicken with pitas and sauce. The Day Mom Said "Yes!" Okay – I have to try this. I love Middle Eastern food, and I never get enough of it. I’m pinning your recipe to my Grilling Recipes board. TODAY. 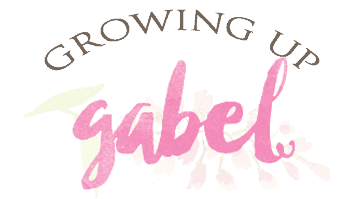 It is one of our family favorites! And it’s pretty quick to make, too! Thanks for pinning. Great stuff! Most of the kids didn’t appreciate the sauce, but Gene and I loved it! We’ll be having this again! Thanks! Yea! Glad you liked it! 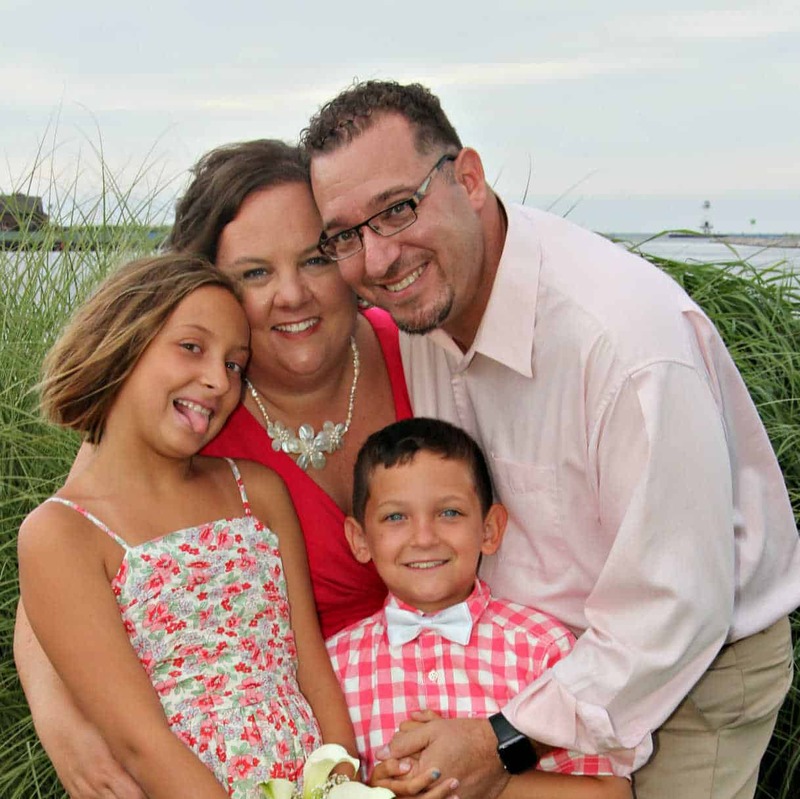 My kids don’t like the sauce either – they just do pitas and chicken! Oh, boy, does this look DELISH! My mom used to prepare pork this way…and now I need to try it with chicken!